A 529 Plan is an education savings plan operated by a state or educational institution designed to help families set aside funds for future college costs. It is named after Section 529 of Internal Revenue Code that governs these types of savings plans, which were created by Congress in 1996. In the federal tax reform legislation passed into law in December 2017, Congress and the Trump administration expanded the use of 529 plan savings beyond qualified higher education expenses to now include tuition for elementary and secondary (K-12) education. Who may set up a 529 account? Anyone can establish a 529 savings account, which would make that person the account custodian, and which would be established for the purpose of meeting the qualified education expenses of the individual designated beneficiary of the account, that is, the student or future student. Any person can set up a 529 account and name anyone as the beneficiary, including a relative, a friend, or even the person (i.e., the custodian) who set up the account. There is no limit to the number of 529 accounts an individual can establish. In addition, a student, or future student, can be the designated beneficiary of more than one 529 account. Do I have to set up a separate 529 account for K-12 expenses different than the 529 account I set up for my child for college expenses? No. You open a single 529 account for each child. That account now may be used for both purposes. If you already have an account for your child, your child is considered the “designated beneficiary” of that 529 account. It is not necessary to establish another account because of the law’s change that expanded the definition of qualified expense to include tuition for elementary and secondary education. When may I begin withdrawing money from a 529 account for my child’s K-12 expenses? Immediately. The federal law became effective January 1, 2018. Does the law include nursery and Pre-K tuition expenses in the definition of “elementary and secondary school tuition”? No. Elementary and secondary school tuition does not apply to schooling below the level of kindergarten; that is, the change in law did not apply to early childhood or pre-kindergarten education. How much may I donate per year to a 529 account? Is it the same for college and K-12? You can donate up to $15,000 per year ($30,000 if married filing jointly) beginning in tax year 2018 without incurring federal gift tax. Contributions of up $75,000 ($150,000 if married filing jointly) also may be treated as having been made over a five-year period, for federal gift tax purposes. Federal law requires 529 plans to have overall limits. Accordingly, individual states have lifetime donation limits ranging from $235,000 to $500,000. In addition, most states offer state income tax deductions for annual donations up to $5,000 ($10,000 if married filing jointly). Additional information on individual state 529 plans can be found at www.savingforcollege.com, which provides an interactive U.S. map where you can examine the features of each state’s plan. How much may I withdraw from my child’s 529 account each year? There are no limits for annual withdrawals for eligible higher education expenses. For elementary and secondary school tuition, an annual maximum of $10,000 per student may be withdrawn. Does my family income factor into whether we are eligible to use a 529 account for K-12 tuition? No. There are no income restrictions whatsoever on family income of the child or on the income of any contributor who is not part of the family. Who may donate to a 529 account? Is it limited to a child’s parents? Anyone can donate to a 529 account, either as the custodian of a plan they set up, or the plan set up by another custodian. Donations to a 529 account are not limited to the parents of the student beneficiary. For example, an uncle or grandparent may contribute to a 529 plan for their nephew or grandchild that was set up by that nephew or grandchild’s parent. If more than one person wants to contribute to a 529 account for my child, will my child have a single account to which everyone contributes or will there be an account set up by each contributor? Anyone can contribute to an existing 529 account; thus, there is no need to set up multiple accounts for the same beneficiary. Others may choose to set up separate 529 accounts for a student beneficiary who already is the beneficiary of another account. Each 529 account must have a single designated beneficiary. Accordingly, parents with more than one child who wish to save for their respective education expenses using a 529 account must establish an account for each child. My child decided to go into the military rather than college. Can I make a withdrawal from his account, which he doesn’t need anymore, to pay for the K-12 expenses of his younger brothers or sisters? What is involved? You can rollover the unused amounts in a 529 plan to another family member of the original designated beneficiary, including a spouse, sibling, the spouse of a sibling, or any first cousin. Rollovers to a non-family member beneficiary would incur taxes and penalties. If there is no other family member to rollover the 529 proceeds, some state plans allow them to be given the original beneficiary which would be subject to taxes. Do I get a tax deduction on my federal tax return for contributing to a 529 account? No. Any growth in the account is tax free on your federal tax returns and there is no federal taxes on any qualified withdrawals, but the initial contributions do not qualify for any federal tax deduction or tax credit. Will the growth in my child’s 529 account be exempt from state taxes? Every state plus D.C. exempts 529 account earnings growth from state taxation. Nine states do not levy any individual income taxes at all; thus, the 529 earnings in these states also are not subject to state taxes. These states are: Alaska, Florida, Nevada, New Hampshire, South Dakota, Tennessee, Texas, Washington and Wyoming (which has no 529 plan). The website www.savingforcollege.com has up to date information on the state tax breaks for 529 accounts in each state: here, which has an interactive map of the U.S. from which you can choose your individual state. Although the federal government doesn’t provide a deduction or credit for my 529 contributions, does my state? A total of 35 states plus D.C. provide a tax deduction or credit or matching grant for 529 contributions. The six states with an income tax that do not offer a tax deduction or credit for contributions nor a contribution matching grant are: California, Delaware, Hawaii, Kentucky, New Jersey and North Carolina. A number of these states are reviewing whether such state deductions or credits will apply to contributions made for K-12 tuition expenses. You should check with your state tax department. Are any withdrawals subject to penalties? Yes, if used for ineligible expenses, for example, other than for eligible higher education expenses or tuition for elementary and secondary tuition. However, individual state plans likely will vary on their respective tax treatment for the use of 529 withdrawals for such K-12 tuition, as each state reacts to this recent change in federal tax law. Withdrawals for non-eligible expenses, that is, non-qualified withdrawals, would transform the 529 account into a taxable investment and subject the account owner to taxes. In addition, if the state allowed for tax-deductible contributions, that portion of the non-qualified withdrawal would generally have to be reported as state “recapture” income. Does the new law apply to children who are homeschooled? 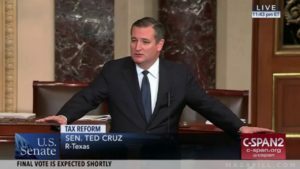 The initial language approved by the Senate (Dec. 2) and House (Dec. 19) included broader language offered by Senator Ted Cruz. This included a provision that 529 account savings can be withdrawn for expenses in connection with a homeschool. However, Senate Democrats, led by Senators Bernie Sanders, Patti Murray, and Ron Wyden, filed a narrow procedural complaint concerning the issue with the Senate Parliamentarian that resulted in the homeschooling language being deleted in the final bill. Senate Democrats claimed the provision violated the obscure “Byrd Rule” which applies to bills passed under tax and budget “reconciliation” procedures. in connection with a homeschool (whether treated as a homeschool or a private school for purposes of applicable State law).’’. What other resources might I consult to learn more?